A Monthly Newsletter of Kāi Tahu news, views and events. Kāi Tahu ki Otago Ltd/ trading as Tūmai Ora Whānau Services has long had a mantra that motivates and mobilises their whānau to believe in themselves and make the change they need to see in their lives. That mantra is ‘in growing kai, we are also growing whānau’. Their recent project for transformation is called Ruia. It is an initiative developed to engage whānau in Ōāmaru and raise the profile and activity at Te Whare Koa Marae. The intent of Ruia is to grow relationships by producing healthy kai and healthy whānau within their community. Of course words are not enough on their own. The hard work has gone in to not just establishing a māra kai at Te Whare Koa Marae but also to put the work into consultation to ensure the benefits are available to all. The original vision for Ruia was whānau building, maintaining and supplying kai for their own. They have a vision to help whānau to reconnect back to the marae, give back to others in the community who have given their time to the marae and to provide whānau with healthy kai at a low cost. Whānau will work together to build and maintain gardens and crops, to supply kai for their own tables as well as those in need. A key part of the initiative is to utilise knowledge of planting and the maramataka within the Māori community of Ōāmaru. Over on the West Coast there has been an amazing initiative which hones in on the strengths of rangatahi through the use of principles encapsulated within wānanga and mātauranga Māori. The focus of the wānanga has been leadership development and strengthening bonds to people and place which anchor rangatahi through testing times. Taking the time for rangatahi to identify the toka tū moana in their lives is so important. 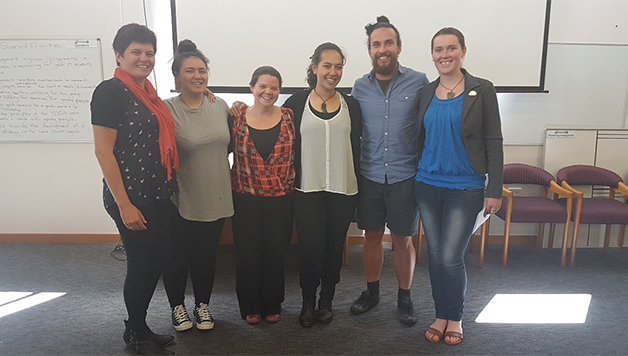 Tuia Te Tai Poutini provides spaces where rangatahi can have meaningful connection around them especially those closest to them – their peers and whānau in particular. They provide leadership wānanga, whānau evenings and whānau workshops. One of the things that has been particularly exciting as a result of this initiative is the immediate lead into sharing youth priorities across the West Coast. In November, discussions took place about relevant research and data regarding West Coast young people, and group work regarding challenges, opportunities, ideas and solutions. Five people had been invited from each of the Buller, Grey and Westland District Council areas, including an elected member, a council staff member, and youth sector representatives (including young people). Te Pūtahitanga: Left to Right: Gina-Lee Duncan (Te Pūtahitanga Contracts Advisor-Te Tai Poutini / Te Tauihu); Ngawahine Thompson – Greymouth High School Head girl Eleanor Sutton; WestREAP Hokitika; Maia Campbell Hokitika High School Head girl; Tihou Messenger Weepu; Georgia Rose Wilkinson.